Marmite is creating a limited edition run of Valentine's Day jars that consumers can personalise with messages to their loved ones. The Unilever-owned savoury spread has tweaked its 2015 personalisation campaign to play on its famous love/hate brand positioning, with an emphasis on "love". 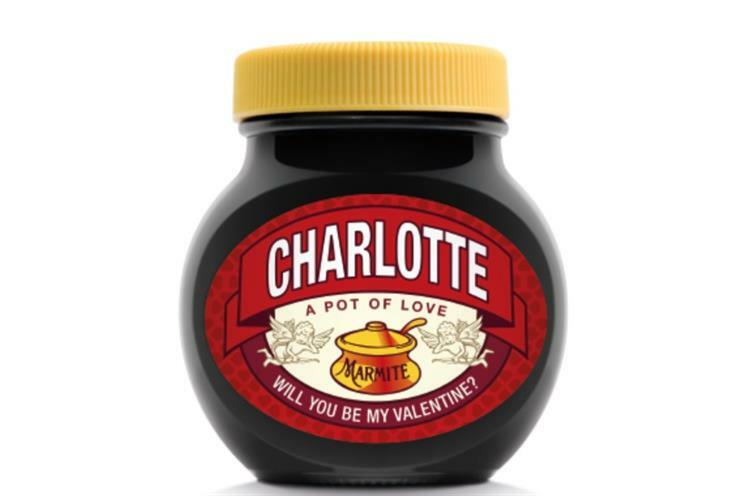 Marmite fans will be able to personalise a redesigned 250g jar of Marmite with the name of their Valentine, and can choose from two declarations: Either "Love me or hate me, I’m yours" or "Will you be my Valentine?" The new-look jars will carry a red label decorated with hearts and bearing an image of two cupids flying around the iconic Marmite pot. The Yeast Extract line has been replaced with "A pot of love". The Valentine’s Day jars have an RRP of £4.99. Philippa Atkinson, Marmite’s assistant brand manager, said: Our personalised classic and Christmas Marmite jars have been a huge hit with fans and we can’t wait to play cupid by spreading the love with limited edition Valentine’s Day themed jars." Last summer, Unilever kicked off a hippie-inspired campaign for Marmite featuring limited edition jars bearing the words "summer of love" or "summer of hate".